Maximise your revenue. Increase your traffic. By joining our free Partner Program, Splut can offer you various ways of making your site pay, and drive more traffic to your website for free, and with minimal effort on your part. 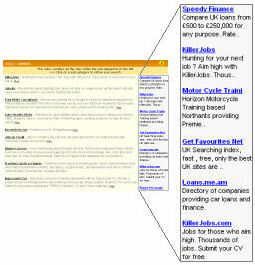 An easy way to display relevant adverts of all sizes on your website and generate income. Splut does all the hard work by examining the content your web pages and showing ads most relevant and most likely to maximise your earnings. More info. Integrate keyword targeted listings in your website based on keywords of your choice and generate income from clicks. Very simple to integrate in your site, with just one line of HTML. More info. Add a web search function to your site, and earn from every clickthru. It's as simple as that. More info. Earn commission on every advertiser you refer to Splut. Generate a constant stream of income. For each visitor you send to Splut, either by direct link or clickthru from a Splut Search Box, you earn a referral credit, which increases your ranking in our Top Referrers Page. More info. One account is all you need..
You don't need to sign up for individual features listed above, one account covers them all.